Xpo Press annually inserts 32,000 copies of our gem show guides into regional (gem show city) editions of The Wall Street Journal, the world's leading business publication. These inserts connect our advertisers with the world's most powerful business leaders, active investors, and affluent luxury consumers. Xpo Press publishes a 52-page gem show guide for TWO 10,000-piece insertions in the Tucson and Phoenix editions of the Wall Street Journal, on the fourth Saturday in December and third Saturday in January. 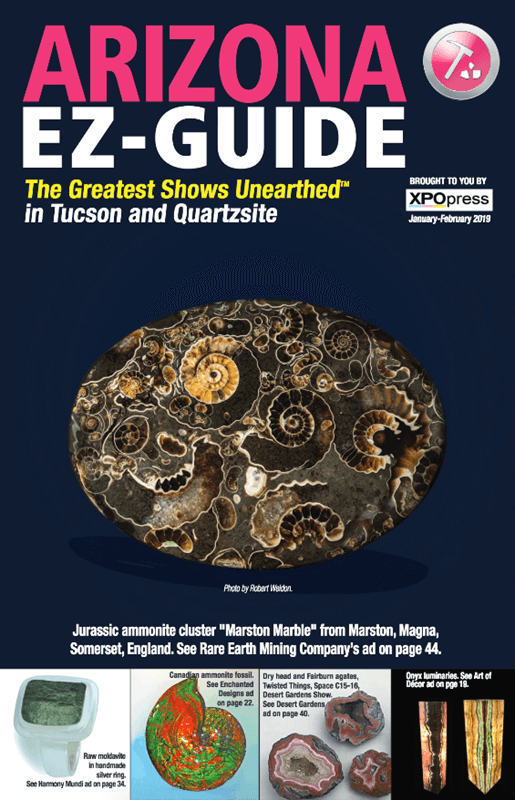 This insert promotes both the famous Tucson and Quartzsite rock, gem and mineral shows taking place in Arizona in January and February, and provides great exposure for advertisers to a high-income demographic that is statistically reported to make luxury-item investments — such as jewelry, mineral specimens or unusual home decor items. Ad rates for this guide. Full-page/$1,322 • 1/2-page/$853 • 1/4-page/$533 • 1/8-page/$327. Discounts range from 3% off to 50% off. Contact Xpo Press to see what discounts you qualify for. 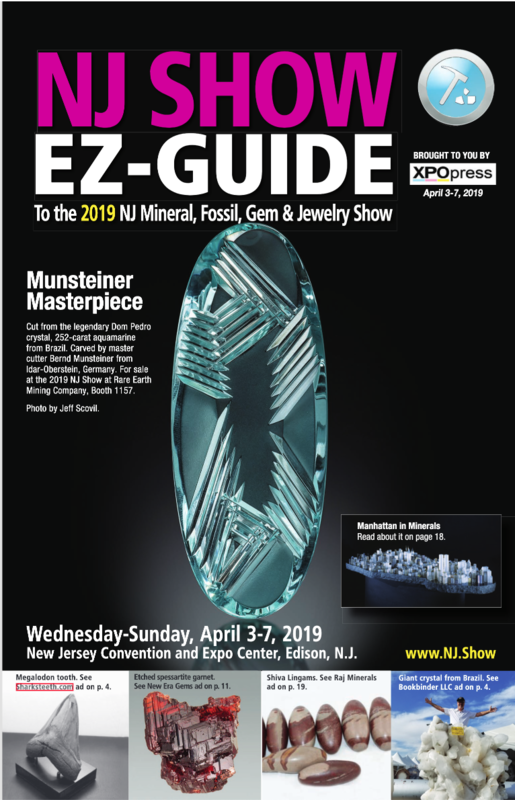 The Official Program of the NJ Gem & Mineral Show, this 7,000-circulation publication is distributed in April in two ways: First, the weekend before the show 2,000 are inserted in to regional Wall Street Journal and delivered to subscribers in East New Jersey and New York City, then 5,000 are distributed free to attendees of the show at the New Jersey Exposition Center in Edison, N.J. The guide contains show maps, a full vendor list, and feature articles related to the products sold and dealers represented at the show. The Official Program of the East Coast Gem, Mineral & Fossil Show, this 6,000-circulation publication is distributed in two ways: First, to promote the East Coast Show and its dealers to potential new buyers, 3,000 programs are inserted in the local Wall Street Journal and distributed — on the weekend before the show opens — to WSJ subscribers/readers in Boston and Springfield, Mass. Additionally, 3,000 are distributed in August to attendees of the show at the Better Living Center at the Eastern States Exposition in West Springfield, Mass. 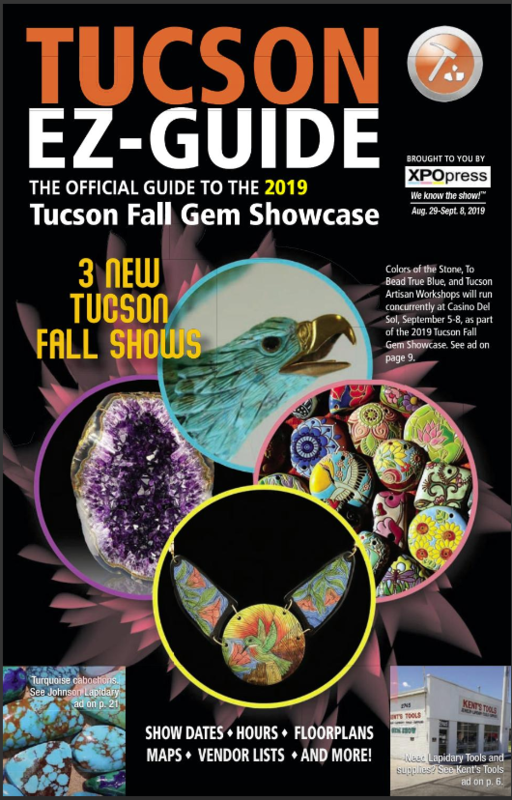 The Official Program of the Tucson Fall Gem Showcase, this 5,000-circulation publication is distributed in two ways: First, to promote the three September gem shows and vendors to potential new buyers, 2,500 guides are inserted in the local Wall Street Journal and distributed — on the weekend before the shows open — to WSJ subscribers/readers in Tucson. Additionally, 2,500 are distributed on racks at the shows — G&LW Holidome, JOGS Gem & Jewelry Show, the Gem & Jewelry Show on Grant, and Kent's Tools, Jewelry, Lapidary & Supplies Show. The Official Program of the Denver Gem & Mineral (Spring) Showcase, this 5,000-circulation publication is distributed in two ways: First, to promote the two April shows and vendors to potential new buyers, 2,500 guides are inserted in the local Wall Street Journal and distributed — on the weekend before the shows open — to WSJ subscribers/readers in Denver. Additionally, 2,500 are distributed on racks at the shows — Colorado Mineral & Fossil (Spring) Show and Colorado Independent Warehouse Show.